Help paramedics identify you and notify loved ones during an emergency – put your cell phone on ICE. Most people carry cell phones, but research shows that more than 75% of people carry no details of who they would like contacted in the event of an emergency that would leave them incapacitated. 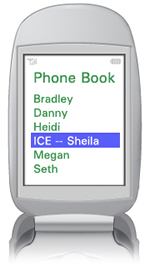 Emergency responders are trained to look for the codeword ‘ICE’ (In Case of Emergency) on the cell phone of a person who is unable to give personal information. 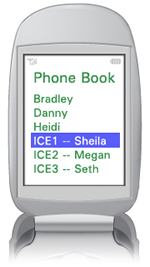 You can have more than one emergency contact - list them as ICE1, ICE2 and so on. Take a look at the picture on the right to see an example of a cell phone with several ICE contacts. REMEMBER - ICE provides valuable contact information to emergency professionals, but should be used in addition to, not in place of, other more standard forms of identification. Cell phones can be damaged; contact information could not be retrieved. Some phone users program PINs, or other blocking actions that would prevent emergency personnel from accessing contact information in the phone. Please make sure to carry a hard copy of your emergency contact information on your person, in your wallet, purse, etc.